THE EMSB EXPRESS: The spring edition of the EMSB Express Newspaper has been published. Hard copies are being delivered to schools. There is a special four page section on the new STEAM program. Here is the link to read the online edition. PROTESTING ELECTORAL DECISION: The EMSB Council of Commissioners adopted a resolution at their meeting March 29, opposing the recent changes to the provincial electoral ridings of D’Arcy McGee, Mont Royal and Outremont. EMSB Chairman Angela Mancini has expressed the Board’s disappointment concerning the sudden, unexplained and unsubstantiated reversal of the Commission de la representation électorale du Québec’s February 7 decision, which would have maintained the status quo in the three ridings. On March 2 the Commission published its final electoral map in the Gazette officielle du Quebec (“the Quebec Gazette”) and merged the ridings of Mount-Royal and Outremont in to one electoral division and substantially changed the boundaries of D’Arcy McGee. Angela Mancini, Julien Feldman and Sylvia Lo Bianco with municipal officials at event to protest changes. The EMSB is calling for no reduction in the number of electoral divisions on the island of Montreal and invited the Quebec National Assembly to express its disapproval with the proposal to merge the electoral divisions. Copies of the resolution will be sent to the Premier of Quebec, the leader of the Official Opposition, the leaders of the other parties at the National Assembly, the Members of the National Assembly within the affected three ridings as well as to the Council of Commissioners of the Commission scolaire Marguerite-Bourgeois. In addition, Ms. Mancini has asked that the resolution be tabled at the next Quebec English School Boards Association board of Director’s meeting for discussion. SCHOOL BOARD ELECTION LIST: According to the provincial Act respecting School Elections, any elector who does not have a child to whom section 1 of the Education Act applies, that chooses to vote at the School board election of the commissioners of the English language school board having jurisdiction over the territory in which he is domiciled, must send a notice to the Anglophone School Board in order to be added on their electoral. To simplify the process, the EMSB believes that a check-off box on provincial Income Tax Forms should be included in order for these electors to be added to a permanent Anglophone school board electoral list. The EMSB Council of Commissioners has adopted a resolution, calling on the Quebec government to enact such a measure. Brianna Haikalis and Michael Tablan from Westmount High with their Eco-Shoes made from corn starch. REGIONAL SCIENCE FAIR: The annual Hydro-Québec Montreal Regional Science & Technology Fair took place March 26 through March 28, on the downtown campus of Concordia University. Organized by Educational Alliance for Science & Technology (EAST), in partnership with Concordia University, this was the third successive year that the Fair was hosted at Concordia and a recent agreement now extends that through 2020. During this one-of-a-kind competition, budding scientists aged 13 to 20 presented their scientific projects to visitors in creative and accessible ways that express their passion for science and technology. Here is a list of how our EMSB students performed. And here is a terrific set of reports from Breakfast Television. Laurier Macdonald lab technician Nadia Audet and student Marie-Lee Scrabbi. FRENCH FOR THE FUTURE: FACE School (3449 University) will be the site for the 2017 French for the Future Montreal Local Forum on Thursday, April 6 (9 a.m.). Aimed at promoting bilingualism amongst Canadian youth, the theme of the annual conference is Respect, Culture and Integration into Québécois Society. Approximately 500 students from 10 Montreal high schools, three school boards and three Jewish day schools will be present. 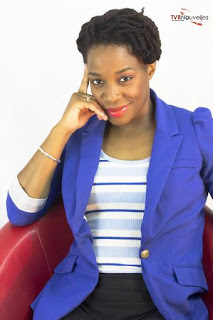 Charismatic Montreal comedian Dorothy Rhau will serve as master of ceremonies. FACE is the only school jointly run by the EMSB and the Commission Scolaire de Montréal, making it a logical choice to host this conference. There will be a musical performance by the group NBGN, starring RACCOON and a special presentation by Maude Morisette, a comedian and the creator of the award winning web series La Dump/The Dump. Other activities will include three present-day competitors on TVA's La Voix, EMSB grad David Marino, Hanorah and Mike Valletta and 2015 finalist and Laurier Macdonald High School grad Angelike Falbo. They will share their experiences, anglophones on a top-rated French language TV show and then turn their chairs to judge students who step forward to sing. Other activities will include an interactive quiz on Canadian and Quebec culture, a francophone youth contemporary and hip hop dance group, Urban Element Zone, a performance by Groupe Harmonie of FACE School and a much anticipated interactive finale starring the always entertaining Ligue D’improvisation Montréalaise. The event will conclude with some exciting prizes presented by local sponsors (Bureau en gros, HMV, EMPIRE, Renaud Bray etc.). Participating EMSB schools are: Westmount High School, Royal West Academy in Montreal West, John F. Kennedy in St. Michel, Royal Vale in NDG and FACE. For more details log on to www.french-future.org. Principal Donna Manos, VP David Servello and their DJs. DJ COMPETITION: The Clash of the High School DJs semi-final event took place on March 17 at the Leonardo Da Vinci Centre in St. Leonard. Ten DJs from five EMSB schools participated (LaurenHill Academy, Vincent Massey Collegiate, Lester B. Pearson High School, Laurier Macdonald High School and FOCUS). Each DJ performed a 15 to 20 minute live set that focused on the mix of different cultures of Quebec and Canada. At the end of the evening, MC DJ Vito V announced the top five DJs moving on to the final round. All three LaurenHill contestants advanced to the top five: DJ EJX Evyn Lewis; DJ Jared Ross; DJ Jared Schmeltzer and DJ Filos, Chris Tomaszos. In addition, Laurier Macdonald and Lester B Pearson each have a contestant in the top five. The final round will be held at the LDV Center on Friday April 21 at 6 pm. Tickets will be sold at the individual schools or purchased at the door. The grand prize for the winner is a trip to Italy to DJ an event in Calabria. ROEN HIGGINS A WINNER: Roen Higgins (pictured), an EMSB childcare worker and behavior technician currently working at Elizabeth Ballantyne Elementary School, was recently recognized with an award during Hooked on School Week. The award was for school perseverance. Born and raised in Montreal, this energetic optimist always channeled her energy into something creative. Everyone knew her as the one to flip words and paint a picture through her diction. Regardless of suggestions to become writer, actor, painter or a comedian, she chose to become a youth counsellor. She is known to the Montreal community as a counsellor, event planner and a community activist. 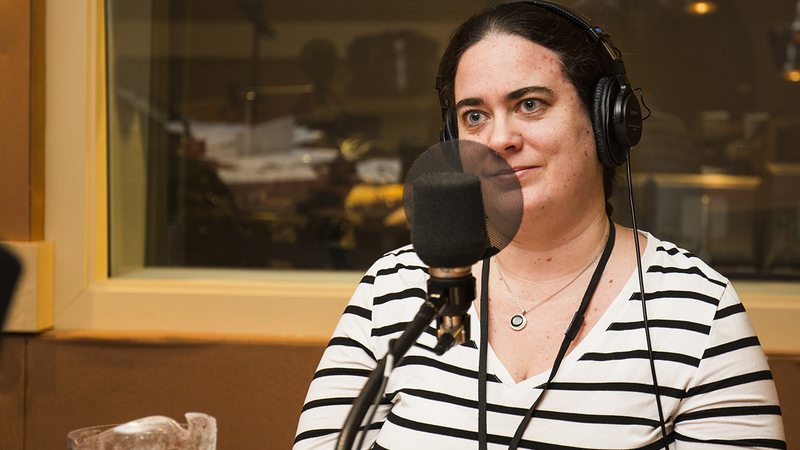 Others know her as Blu R’va, a repeat winner in the scene of improv & slam poetry. Roen’s passion is to provide a creative platform for youth and young adults to translate their lives through God’s gift to them, which she believes is a therapy of a lifetime. A 2012 recipient of The Gloria Mitchell-Aleong Award, Roen’saccomplishments in the community was recognized at the Black Theatre Workshop Vision Gala. Recently a 2016 Montreal Community Care Awards recipient for Community Leadership, she is a social and cultural architect whose goal is to empower others to live their Lives in First Class by learning who they are, realize their full potential and build their legacy. Projects to look out for is Black Gold Voices (a podcast to inspire change makers by connecting them with other powerful successful people. Good Folkes (connecting ambassadors of change to make a difference in the community and a clothing line called Trooth Empire which is a movement to empower youth to know their roots and learn literacy & entrepreneurial skills. EMSB TEACHER WINS NOMINATION: In what political pundits are calling an astonishing victory, Rosemount High School teacher Emmanuella Lambropoulos captured the Liberal Party nomination for the federal riding of Saint-Laurent-Cartierville, upsetting former Member of the National Assembly and Quebec cabinet minister Yolande James as well as Mawhra Rizqy. 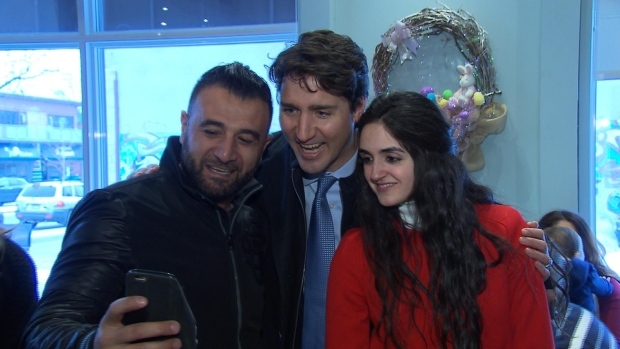 Emmanuella Lambropoulos and Prime Minister Trudeau take a selfie with an admirer. NATIONAL TEACHER'S DAY: The EMSB, in conjunction with City's Breakfast TV, will mark National Teacher's Day on May 2. Stakeholders are asked to nominate their favorite teachers from the youth and adult sectors, as well as a physical education teacher. The former two will win $100 gift cards to dine at PF Chang's while the latter will get a $100 gift card for La Cage Brasserie Sportive. Breakfast TV's Catherine Verdon Diamond will interview the teachers at a special ceremony held to mark the occasions. Nominations should be sent to mcohen@emsb.qc.ca. JAMES LYNG REUNION: A 50th anniversary reunion for James Lyng High School (5440 Notre Dame Street West) will take place on Saturday, May 20 (6 pm) all for students who attended between 1967 and 2017. Tickets are $40. There will be light refreshment, a cash bar. music and dancing. Info: jlhshomecoming@gmail.com. FOOD REVOLUTION DAY: To celebrate the accomplishments of B.A.S.E. Daycare students from the Green and Cooking Clubs, as well as celebrate Food Revolution Day, B.A.S.E. is hosting a Sustainable Food Trade Show and Cook-Off on Friday, April 28 (10 am to 2:30 pm) at St. Pius X Culinary Institute (9965 Papineau). Vendors will showcase their wares and services while 12 daycare students will team up with two local chefs and a chef from St. Pius to create two dishes for a panel of judges and showcase their new-learned skills and knowledge of food. Participating schools are Cedarcrest, Gerald McShane, John Caboto, Pierre de Coubertin, Sinclair Laird, St. Dorothy, St. Monica and St. Raphael. HOCKEY EXPERIENCE: Four international students from the EMSB, along with two student coordinators, had the opportunity to see their first ever professional hockey game on February 28 when the Canadiens hosted the Columbus Blue Jackets at the Bell Centre. The Habs won 1-0 in overtime. This experience was made possible thanks to the generosity of businessman Joel Leonoff, who provided tickets in his company Paysafe Group Plc’s private box. Students Jiyong Kim (Marymount Academy International-Korea), Andres Lezama (LaurenHill Academy-Mexico), Keying Yu-Chl (LaurenHill Academy- China) and Nicole Fabianova (Westmount High School-Slovakia) enjoyed the game, accompanied by international students’ coordinators Angela Kim and Elisa Medellin. 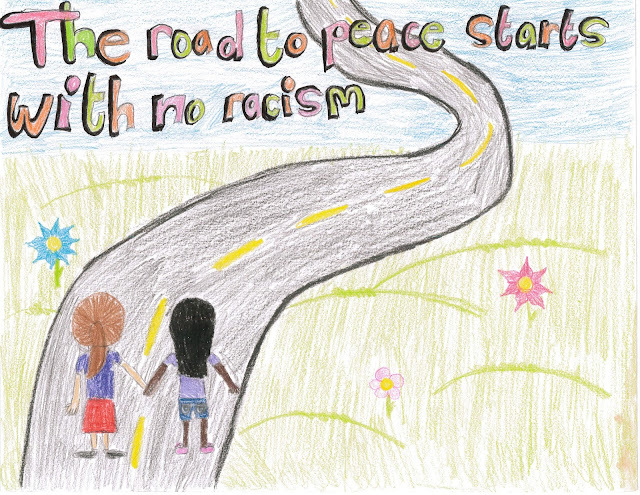 DESIGN CONTEST: Pierre de Coubertin Elementary School in St. Léonard had two winners for the Dessine-moi la fin du racisme contest. 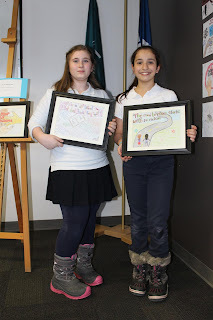 Kyra Rousketos (below right and photo above) and Samantha Antioco-Neves had their drawings chosen. Kyra was honoured on March 21 at Station 42. DANTE GIVES BACK: The students and staff at Dante School will be embarking upon a fundraising campaign on April 12 and 13 with musical presentations at 1 pm each day for the benefit of Corporation L’Espoir. This will allow students with special needs to enjoy a summer camp experience. The goal of this initiative is to give the children an unforgettable experience while providing support to families. Corporation L’Espoir assists children who are intellectually handicapped and on the Autism Spectrum. Teacher Elaine Frenette says that most of the songs will relate to friendship, challenges and passion. Info: -http://corporationespoir.org. Ms. Frenette can be reached at elainefrenette@hotmail.com. Meanwhile, Carnival Day (pictured above) at Dante was a huge success. 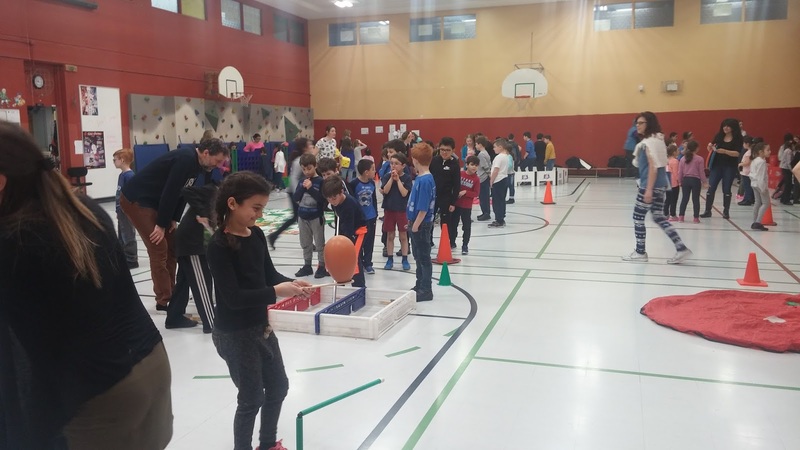 Despite the lack of snow, the carnival committee planned a fantastic day of indoor activities that were enjoyed by all students! 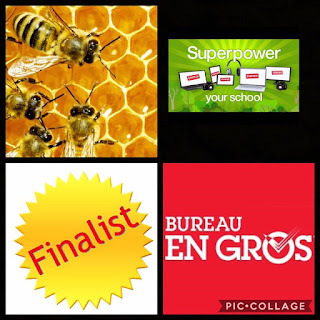 SUPERPOWER YOUR SCHOOL: Laurier Macdonald High School is happy and excited to announce that it is a finalist among the top 100 schools in Canada (top 20 in Quebec) to have been selected as a finalist in Bureau en Gros' Superpower Your School contest. They are in the running to win $25,000 to spend toward technology for our school. This is due in part to the ongoing projects they have going on with our LMAC bees. Winners will be announced in time for Earth Day 2017. #LMACtivism. LAURIER MAC GRAD AT CENTAUR: Montreal playwright Michaela Di Cesare, a graduate of Laurier Macdonald High School in St. Leonard, will have her new play “Successions” make its world premiere at the Centaur Theatre from April 10 to May 6, 2018, as part of its 49th season line-up. This comedy tells the story of two second generation Italian Montrealers: one is a lawyer who is running for public office, and the other is his lackadaisical-minded kid brother who would rather party than hold a steady job. Following the sudden death of their parents, the brothers have to make a difficult decision: should they hold on to their family home – which is basically a rundown structure filled with worthless junk, memories and secrets – or sell it and move on with their lives? Ms. Di Cesare is an accomplished, award-winning writer, whose previous credits include the comedies “8 Ways My Mother Was Conceived” and “In Search of Mrs. Pirandello,” which was an audience favorite at the Centaur’s annual Wildside Theatre Festival. CATCHING STEAM: Elizabeth Ballantyne Elementary School in Montreal West continues to work towards adopting the STEAM(Science, Technology, Engineering, Arts and Mathematics) program. Students in two classes recently worked on a STEAM project. These students had to build catapults that could knock down a cardboard tower. They were separated into groups and were given a set of criteria to meet. Students enjoyed the project - working with their peers and being able to relate to the topics learned in class. EBS students show off their pink t-shirts. 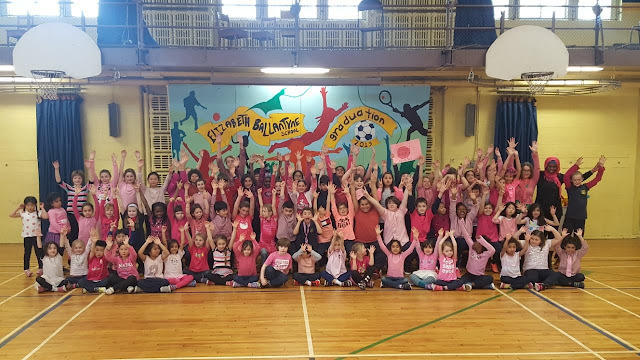 ANTI-BULLYING DAY: EBS marked Anti-Bullying Day on February 22 as students proudly wore pink t-shirts. LBPHS students get into the spirit. 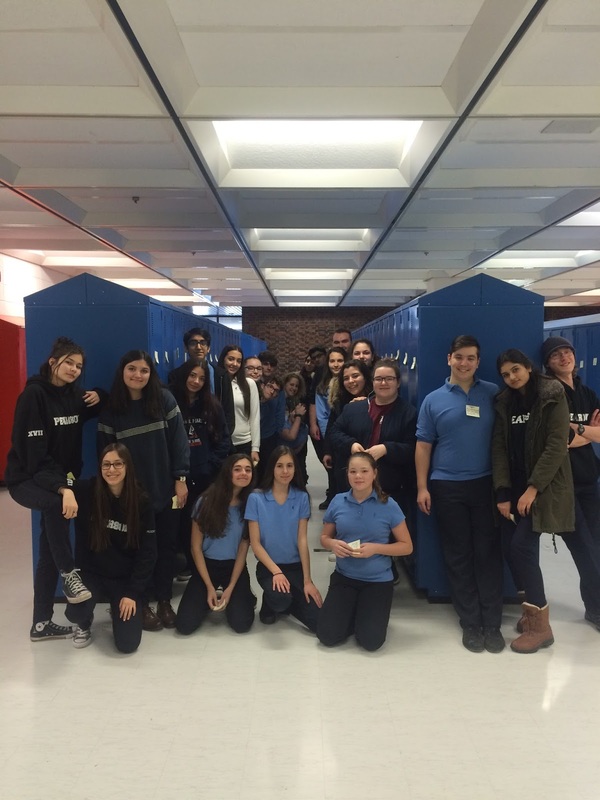 EMPATHY DAY: Lester B. Pearson High School in Montreal North recently conducted its third annual Empathy Day, a Student Council initiative that cultivates a greater sense of community. For the past few weeks, Student Council members throughout all five levels planned and executed a campaign in kindness. Upon entering the building on Wednesday students were greeted by encouraging post-it notes adorning all of our lockers and oversized positive-themed take what you need posters on all of our bulletin boards. At recess and lunch, Council members greeted others with hugs and lollipops. The largest aspect of programming were period two and three assembly and workshops for students in Secondary IV. These experiential activities in reflection, empathy, privilege and stereotyping helped place students in the shoes of the victims of insensitivity. The school hopes that this annual custom will lead to a greater sense of belonging and understanding throughout the school community and that these positive gestures will result in students feeling more welcomed at Lester B. Pearson and meet each other with a more kindness and compassion. NUTRITION MONTH: March was Nutrition Month all across Canada and in celebrating this, Cafeteria and Nutrition Education Services of School Organization prepared an array of nutrition activities. The campaign aims to promote healthy eating habits on a daily basis by promoting nutrition awareness and increasing nutrition knowledge. In elementary schools, celebrate Nutrition Month 2017 by taking the March to Health and completing fun and educational challenges related different nutritional themes. If you participate, your class can accumulate points with each activity completed and can even win a Culinary Workshop! Furthermore, in-class activities which give students the tools to read and better understand nutrition labels are available all year-long in elementary schools as part of the “Read What You Eat” series. Animated by an EMSB dietitian, these activities are building blocks for our kindergarten to grade 6 students to increase nutrition knowledge and help them make healthy food choices. HIGH SCHOOL ACTIVITY: In high schools, the nutrition program entitled “EAT RIGHT FEEL BRIGHT” took place in the form of in-class sessions geared towards Secondary I and II students in Physical Education and Health classes. The aim was to encourage healthy lifestyles through good nutrition and physical activity and to sensitize students to the social influences on their perception of health and well-being. In high schools, the EMSB 2017 Nutrition Month Campaign was March to Health - Are You Ready to Challenge Yourself to Become a Healthier? To celebrate this event, high school teachers along with their students are invited to participate in educational activities and challenges to give students the knowledge and tools to make healthier food and beverage choices. Marc Garneau checks out one of the projects. MARC GARNEAU VISITS: On February 27, Marymount hosted its 15th annual Science Fair. The event took place in the school gym. Thirty three projects were displayed by students from Secondary I to III and all classes visited the exhibits. Federal Transport Minister and Westmount-NDG Liberal MP Marc Garneau attended the event as well. He viewed the exhibits and spoke with students, also answering questions regarding his experience as an astronaut. MMA`s Science Dept. is named after Mr. Garneau for his love of science and many contributions to and for Canada. The event was greatly appreciated by all students and staff. Louise Chalouh and some of her students. INDEPENDENT READING LIBRARY: Elizabeth High School in Ville Émard, which caters to teenage moms and pregnant teens, recently inaugurated an Independent Reading Library. Head teacher Louise Chalouh, who has been at the school for 31 years, thanked Principal Craig Olenik for providing the funding – surplus money from last year`s EMSB budget which was allocated for this purpose. She purchased a large book cabinet, a carpet, two nice chairs and two bean bags. Books of different categories are being organized by librarian Nick Warren. Since many of the students bring their babies to the building, appropriate books from toddlers are also being collected. At the inauguration students Nancy, Melissa and Megan and staff described books they recently completed. Teacher Lise Kuhn had received a grant from the Association of Teachers of English in Quebec (ATEQ) to buy a significant portion of the books for the library. MOTIVATIONAL SPEAKER LLOYD BARKER: Former Montreal Impact assistant captain, team MVP, league all-star and one-time assistant coach Lloyd Barker is available to visit schools as a motivational speaker. His talks are geared towards students aged eight and up. There is no cost for Lloyd’s talk. He just asks that the school distribute flyers for his new soccer academy to students in attendance. His presentations combine motivational topics (perseverance, appreciation, etc), an emphasis on the importance of staying in school, as well as training and wellness tips. The duration is between 60 and 75 minutes. He suggests that schools combine the classes into one big group and assemble in the gymnasium for the presentation. Mornings are preferential. Barker Elite Soccer Training will expertly teach every essential core skill in order to enhance the player's technical ability, enabling them to correctly execute the various skills on a consistent basis. As each skill is being taught, it is explained to the players exactly how the skill applies tactically in games. Training programs and curriculum are designed to suit each player individually and is based on the Canadian Soccer Association's Phases of Development and Long Term Player Development model. By keeping the groups to a maximum of four players for each of our experienced instructors, the players are provided with the individual attention needed during each Training Session. You can find out more about his academy at www.best11academy.com. Lloyd can be reached at lloydbarker11@yahoo.com. VOLUNTEER NIGHT: The annual EMSB Board Parent Volunteer Appreciation Evening will take place on Tuesday, April 4 at the Crowne Plaza Hotel on Cote de Liesse. It is sponsored by La Capitale Financial Services. This year’s event is being held to commemorate National Volunteer Week, which runs from April 16 to 22, under the theme of Volunteers - Part of Our Heritage. Montreal Mayor Denis Coderre will give opening remarks. 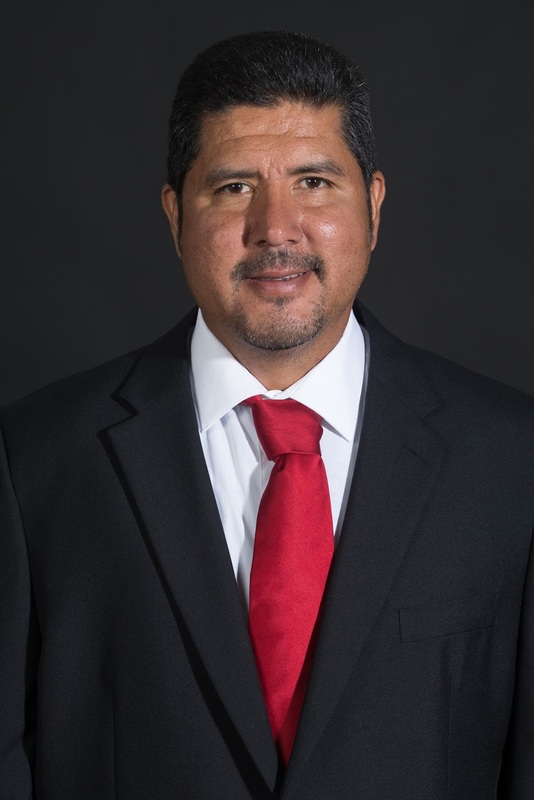 Football legend Anthony Calvillo , who had an outstanding career as the quarterback of the Montreal Alouettes where he is now an assistant coach, will receive the first ever EMSB Volunteer Ambassador of the Year Award. Anthony and his wife Alexia are the parents of two students at Gardenview Elementary School in St. Laurent. Over the past two decades, Anthony has graciously visited schools and shared his "Stay in School" message with students. The Volunteers of Distinction this year are Rosario Guzzo and his late wife Rosa from Michelangelo International Elementary School in RDP. Rosa passed away in January. Rosario and his son will be on hand to accept the award. Time and space do not allow the EMSB to honour all of its nearly 1,500 volunteers in person. Therefore, only those individuals who have volunteered for more than five years will attend the reception, representing some 500 people. However, several thousand copies of a commemorative program book will be distributed to each school. The emcees for the evening will be Global News senior anchor Jamie Orchard and EMSB Communications and Marketing Specialist Michael Cohen. For the eighth consecutive year, La Capitale is the title sponsor for this event. La Capitale Financial Services (www.lacapitale.com) which is a member of La Capitale Financial Group, offers a wide range of products and services that are designed to simplify financial choices for members working in the public and para public sectors in over 900 public and para public institutions across the province. These services include: personal financial advice; savings, investments and funds; individual life and health insurance; mortgages and personal loans; insurance for automobiles, recreational vehicles, home, travel and legal access; commercial insurance; and group insurance. WE DAY: The EMSB had a strong presence at WE Day Montreal at The Theatre St. Denis on February 23.WE Day is a powerful, life-changing event that combines the energy of a live concert with the inspiration of extraordinary stories of leadership and change. It brings together world-renowned speakers and award-winning performers with tens of thousands of young people to celebrate their contributions and kick-start another year of change. The program has evolved from a single event nearly eight years ago into a series of 14 stadium-sized events held across Canada, the United States and the UK. This past year, 200,000 students attended WE Day and left inspired to create change at local and global level. EMSB schools represented included: John Caboto Academy in Ahuntsic; John F. Kennedy High School and Perspectives I and II Alternative Schools in St. Michel; Pierre Elliott Trudeau and Nesbitt Elementary Schools and Vincent Massey Collegiate in Rosemount; Rosemount High School; Dante Elementary School, John Paul I Junior High School and Laurier Macdonald High School in St. Léonard; Dalkeith Elementary School in Anjou; Coronation Elementary School in Côte des Neiges; Marymount Academy International, Willingdon Elementary School and Focus and Mountainview Alternative High Schools in NDG; Lester B. Pearson High School in Montreal North; LaurenHill Academy in St. Laurent; Carlyle Elementary School in TMR;, Edward Murphy Elementary School in Hochelaga-Maisonneuve; Hampstead Elementary School; and Royal West Academy in Montreal West. EMSB students Alysha Guarino from Lester B. Pearson High School and Monica Rosauri from Laurier Macdonald High School served as student spokespersons for the event. Guest speakers included singers Jordan Smith, Tyler Shaw and Alex Nevsky, actress Mia Farrow and the Celebrity Marauders. 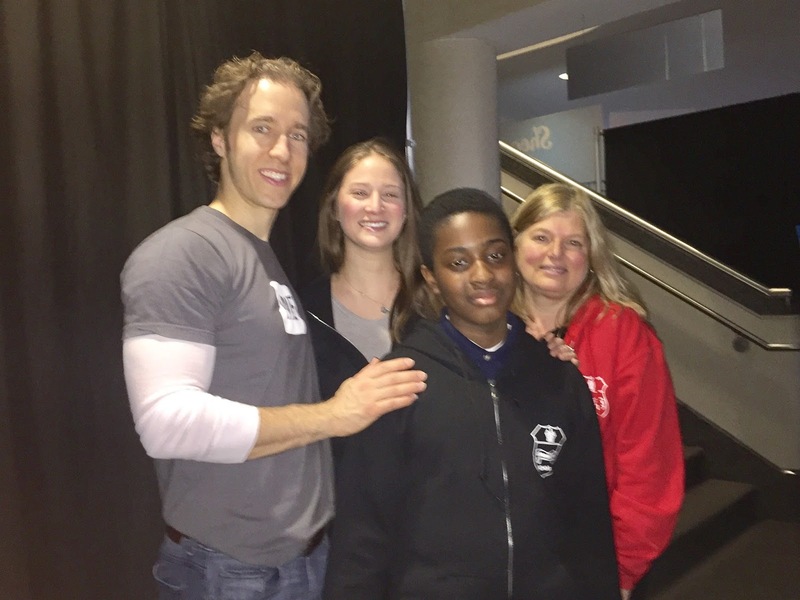 A number of EMSB students met with We Day Founder, Craig Kielberger. CHOOSING EMPATHY FIRST: The Live Different group recently brought their Choosing Empathy First tour to Vincent Massey Collegiate in Rosemount, inspiring students to adopt a lifestyle of empathy and compassion for others. Students learned that cultivating empathy is one of the most significant keys to becoming a compassionate, connected and resilient global citizen. INSPIRATIONAL KYLE: Kyle Taylor, a Grade 6 student at Coronation Elementary school in Côte des Neiges, is a caring, gentle, generous and empathetic student. Since the month of September, he has volunteered his lunch hours four days a week helping the school`s junior ASD (Autism Spectrum Disorder) classroom. He helps supervise the students by eating and playing with them in their classroom during lunch. In addition, he has now volunteered to supervise and mentor the transition of one of the ASD students into the schoolyard and cafeteria. The day of the week that he is not with these younger students, he is volunteering in our "Kids for Social Change" group, where social issues are discussed and projects to better the school and the community are implemented. Kyle has been a reliable member of the group and consistent contributor to the well-being of the school community. He was one of the children selected for the 2017 Governor General's "Sovereign's Medal for Volunteers" award. It was presented to him by Craig Kielburger, founder of Free The Children, at We Day Montreal on February 24. Teacher Valerie Chiniara nominated him. .SPARKING THE IMAGINATION: Igniting the imagination is the true starting point of every learning journey and touches all subjects in any language that Grade 5 students at Royal Vale School can attest to. In Wendy Frank's English class, the students have been shedding light on the writing process with author Lydia Lukidis and are working collaboratively on writing and illustrating a picture book. In groups, the students are writing different components of a story. In Mme. Malhamé's drama class, the students have been furthering their exploration of Commedia dell’Arte under the guidance of EMSB consultant Nicolas Doyon. When bringing different characters to life, the students have been experimenting with different movements including fluide, saccadé, lourd and léger. They are learning the importance of working as a team in order to bring a creative piece to fruition. Both these workshops have been wonderful learning experiences for all involved! CELEBRATING ARTS AND CULTURE: During Arts Week, Royal Vale Elementary students wore their rain boots and participated in a Gumboots dance under the guidance of Sabra-ley Beugrey. They did so in order to pay homage to South African workers who sang as they laboured under difficult working conditions. Versing our students in an understanding of historical narratives is a key element in helping them pave the way for a more inclusive society that respects human rights and embraces diverse cultures. During Arts week the students and their teachers also discussed the importance of art and dressed up as their favourite artist which added a lot of fun and colour to their day! SCRIPPS NATIONAL SPELLING BEE: An event took place recently for the Scripps National Spelling Bee at Royal Vale. All students from Grades 3 to 6 took part in it at the classroom level. The students worked hard in order to compete at the best of their abilities. There were semi-finalists in each grade level who competed in order to reach the level of competition in the Main Auditorium at Royal Vale. Of those semi-finalists, 14 made it to the finals in the Main Auditorium. The students who made that level were: Jack Mitchell (Grade 3); Noah Giberowitch (Grade 4); Griffin Wilson-Boode (Grade 5); Chelsea Goldwater (Grade 6); Gabriel Lola Mandato (Grade 3); Samson Weber (Grade 4); Laura Chriqui (Grade 5); Devon Packer (Grade 6); Myles Serry (Grade 3); Christian Lobaugh (Grade 4); Lelah Atallah (Grade 5); Sarang Han (Grade 6); Findley Lourie (Grade 3); and Aidan Westra (Grade 4). The winner was Devon Packer; runner-up, Griffin Wilson-Boode; and third place, Gabriel Lola Mandato. These students were eligible to move onto the Regionals in Ottawa, Ontario. Devon Packer placed third, Griffin placed seventh, and Gabriel made the first few rounds. “It was a wonderful experience for all, including the parents/guardians!” said Ms. Frank. KIDKNITS: Royal Vale's Grade 2 and 6 students are learning to knit using KidKnits fair trade craft kits. The yarn is hand-spun from women living and working in poverty in developing countries. The KidKnits program offers our students simple craft kit that is integrated with a comprehensive service-learning curriculum. The students are learning to knit winter hats. They are also learning and understanding the realities of global poverty, while reflecting on the questions of who is their neighbor while being empowered to help change the world. Meanwhile, Grade 2 students recently helped the Knock, Knock; Give a Sock organization collect for those in need. The students prepared bags with warm socks and heartfelt words of encouragement to homeless people in Montreal. The RVS families also helped make this campaign a success and a special thank you goes out to Leah, Lex and Olam for spearheading the initiative. 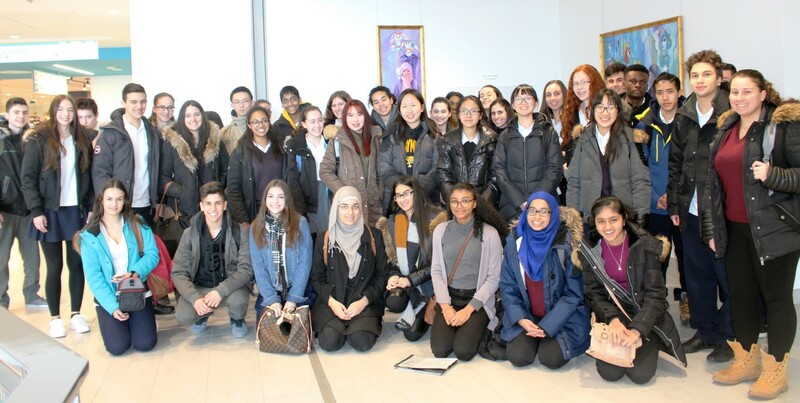 SPIRIT QUEST: On Thursday April 20, students and Spiritual and Community Animators (SCA`s) and students of the EMSB will be taking part in an event aimed at visiting sacred spiritual sites and experiencing compassion in action in order to further develop their spiritual awareness. According to First Nations traditions, one goes on a Spirit Quest with the hope of experiencing an inner change, a healing, and an openness to others and to the divine. There will be a number of links to Earth Day, including celebration of First Nations’ traditions of caring for the earth and for one another, at the launching of the Spirit Quest. The third EMSB-SCA Spirit Quest will involve twelve schools - John F. Kennedy High School in St. Michel, John Paul I High School in St. Leonard, Laurier Macdonald High School in St. Leonard, Lester B. Pearson High School in Montreal North, Lauren Hill Academy Sr. and Jr. in Ville St. Laurent, Marymount Academy International in Montreal, Rosemount High School in Rosemount, Royal Vale High School in NDG, Royal West Academy in Montreal West, Vincent Massey Collegiate in Rosemount and Westmount High School in Westmount. Spirit Quest teams will commence their day-long journey at the EMSB Central Office at 6000 Fielding Avenue in NDG at 8:30 a.m. and conclude around 3:00 p.m. at Beaver Lake on Mt. Royal. Students will be tasked with completing a photo challenge, gathering information and be inspired to give back to their own community. Actions will include honouring and visiting sacred sites and learning about the history of different cultural and faith communities in Montreal, visiting Mt. Royal for a time of reflection and sharing as well as taking care of our green spaces. One of the goals of the SCA service is to facilitate and encourage students to put into action their best self, and express their own positive virtues and character traits. This is the “Virtues Program” delivered by the SCA service that is the foundation of the EMSB/SCA Spirit Quest, representing a journey to deeper self-understanding. Each team will consist of a maximum of six students aged 12 to 16 and one SCA. They will navigate a series of clues to get from one location to another by walking or using eco-friendly public transit, encountering spiritual challenges along the way. The Spirit Quest allows students to visit civic, historic, and spiritual and community organization sites while obtaining personal experience in developing positive virtues and character traits, strengthening the bonds of school-community relations as well as their intimate connection to the earth and their own spirit. TRIP TO US CANCELLED (MONTREAL GAZETTE REPORT): Sabrina Jafralie is a high school ethics teacher whose students were recently presented with a real-life test of their character. Westmount High School had planned a senior trip to Washington, D.C., this spring, but newly imposed travel restrictions by the U.S. government meant some of the students might be turned aside at the border. On Monday, President Donald Trump signed an executive order temporarily barring citizens of six majority-Muslim countries from entering the United States. Because three of Jafralie’s students are from Iran — one of the countries subject to the travel ban — she met the senior class before March break and presented them with an ethical predicament: should the entire group make a sacrifice to protect the rights of a handful of their peers? Though Jafralie admits the class’ new destination — Toronto and Niagara — doesn’t have the same allure as the U.S. capital, she says more students have signed up for the trip since the change of plans. About 100 students and teachers are on board. “I think the most important part of any class trip is that we’ll be together,” said Julian Green, a Grade 11 student at Westmount High School. “It’s not fair if we just tell a couple of kids: ‘Given the circumstances, you just can’t go on this trip, but everyone else can.’ If you put (yourselves) in their shoes, if you’re not allowed going on a trip because of your nationality, that’s incredibly unfair. ANIMAL WELFARE: Colleen Ovenden is the former Director of Education at the Montreal SPCA and now the Co-director of a new initiative called ENGAGE: Animal Welfare Education (http://engageanimal.org). This organization works collaboratively with schools, community organizations, etc. in order to promote animal welfare and thereby improve not only the lives of animals but the community as a whole. They have been delivering their experiential-learning programming to a number of EMSB schools (Sinclair Laird, Parkdale, John Caboto) in after-school programs and they are now about to begin two 10-hour day programs (John Caboto, Cycle 2, Nesbitt, Cycle 3). If your school is interested call Colleen at 514 999-9465, e-mail colleen.engage@gmail.com or log on to http://engageanimal.org. Brianna with Westmount High basketball players. 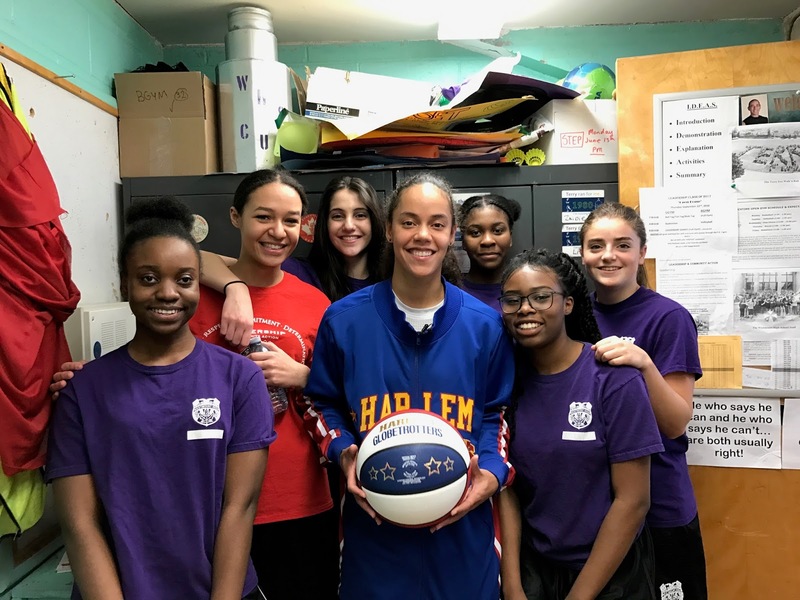 MEETING A FEMALE GLOBETROTTER: Students at Westmount High School and Roslyn Elementary School had the chance to spend time with Brianna “Hoops” Green of the Harlem Globetrotters. Brianna also dropped by Roslyn School.In town to promote the Globetrotters’ appearance at the Bell Centre on April 9, Hoops spoke to the students about her career and being a member of the world famous Globetrotters. Since their inception in 1926, Hoops is only the 15th female member of the team. Brianna stops by Roslyn School. EMSB IMPACT NIGHT: For the 12th year in a row, the EMSB is pleased to announce the continuation of a partnership with the Montreal Impact soccer team through its “All the Way with the Impact” program. Over the next few months, members of the Impact will be visiting schools to remind young students of the importance of studying, persevering and building self-confidence in order to succeed. The traditional “EMSB Night," this year bringing the Vancouver Whitecaps to town, will take place on Tuesday, May 30 (7:30 pm) at Saputo Stadium as part of the Amway Canadian Championship. This involves the top five professional clubs in Canada, in the race to qualify for the CONCACAF Champions League. That is an international competition between professional clubs from North America, Central America and the Caribbean. Tickets, which are usually $20 each, are priced for EMSB families at a discounted $14 each. Some of the proceeds from ticket sales will go towards Inspirations, a publication dedicated to the special needs community. We will accept orders on a first-come, first-serve basis from the schools and there is an option to purchase tickets safely and securely via credit card. For more information visit www.emsb.qc.ca/impact. Two students will also win $500 Tony Licursi Scholarships. 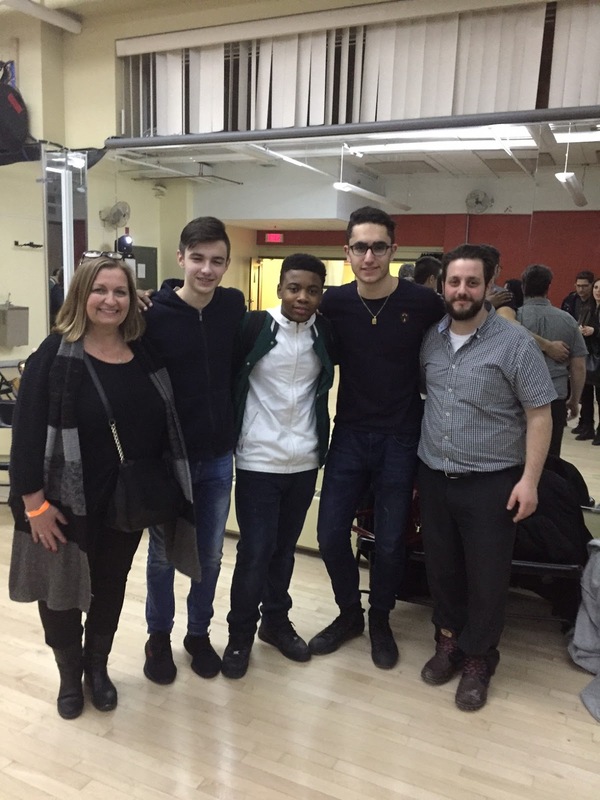 FACE AND SPRINGHILL SUITES PARTNERSHIP: The FACE School Foundation received some very welcome support recently when the SpringHill Suites by Marriott Old Montreal announced a partnership in order to maintain, support and enhance the fine arts program at FACE School in Montreal. In its commitment to supporting the local community and arts education, SpringHill Suites by Marriott Old Montreal has planned a series of events and initiatives throughout 2017 to raise funds and awareness for the FACE School Foundation. For more information about any of the above efforts, or to book a stay at SpringHill Suites by Marriott Old Montreal, call 514-875-4333 or visit www.springhillmontreal.com. Rates start at $142 per night. For more information on FACE School, please visit: http://face-english.csdm.ca. CAREER EXPLORATION AT THE MUHC: What would it be like to study medicine and pursue a career in health care? That is the question that 57 high school students were here to explore when they visited the Glen site on February 27 as part of their Career Exploration Day activities. Students take a break from their MUHC visit. The students then met with Dr. Jae-Marie Ferdinand, a pediatrician at the MCH and director of the Social Pediatrics Training Program at McGill University. With a wealth of experience in the field, Dr. Ferdinand gave the students an enlightening understanding of the many different roles and functions she undertakes, from her day-to-day work at the MUHC’s Medical Day Hospital to her involvement as a Consultant Pediatrician with the Batshaw Youth and Family Centres and the Portage mère-enfant programme. She described her passion for working with children and the desire to continue learning that has guided her during her career, as well as the importance of good time management skills. When asked what, if anything she would have done differently, Dr. Ferdinand answered, “I would have taken more time to play.” As she explained, when she was a student, the university placed a great deal of emphasis on having very high grades in order to get into medical school, whereas now, they look for candidates who are well-rounded and balanced. She encouraged the students to work hard, but also to take the time to get involved in sports or creative activities that bring them pleasure. MERTON TEACHER ON RADIO: Audrée-Ann Dupont, a teacher at Merton Elementary School in Côte Saint-Luc, appeared on the ICI Radio-Canada show called Médium Large, with host Isabelle Craig. The focus was on French immersion in Canada . You can hear the interview here. Kathleen Usher and her students. TOONIE CHALLENGE: Willingdon Elementary School in NDG has raised over $2,000 for the Friends of the MUHC and the Montreal Childrens’ Hospital in this year’s Toonie Challenge. Science teacher Dr. Kathleen Usher integrates the Toonie Challenge with the Grade 5 unit on the Human Body. As students learn about their human body systems they also learn more about the hospital that is there to look after them if ever the need arises. Students attended the Toonie Event, hosted by Roslyn school this year, in November and were inspired by the many hands on workshops and kiosks that MUHC staff, students and volunteers ran. They returned to school ready to galvanize the school population and collect those Toonies! The winning class was celebrated with a party planned by Grade 5 right down to the playlist, the games and the Sundae Bar! 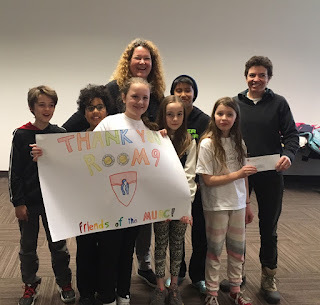 Last week six students, accompanied by Dr. Kat, got to present the cheque to the Friends of the MUHC Board of Directors and were then given the special opportunity to tour the Complex Care unit at the Childrens’ and see the state-of-the-art baby scales their Toonie Challenge had helped fund. The staff at the MUHC was very taken with these bright, outgoing Willingdon kids and the students were very impressed with the new hospital! WE AT WILLINGDON: This year Willingdon's long tradition of community involvement and charity work got a huge boost by becoming a WE school. WE Charity is an international charity and educational partner. The organization is unique among Canadian charities in that it operates collaborative programs both domestically and internationally. Willingdon’s existing social, community and environmental initiatives are now run under the WE umbrella. Becoming a WE School will enable Willingdon to reach out even further into international initiatives such as WE Villages. Students enjoyed attending this year’s WE Day event at Theatre St. Denis and Willingdon is more ready than ever to initiate and sustain lasting positive change in our school, our community and our world! GOLDBLOOM ESSAY CONTEST: David Birnbaum, MNA for D'Arcy-McGee and Parliamentary Assistant to the Minister of Education and the Minister of Higher Education, has announced the second edition of the 'Victor Goldbloom Vivre Ensemble Essay Contest. Victor Goldbloom, the first MNA for D'Arcy-McGee, first Jewish Cabinet Minister in Quebec, first Minister of the Environment, passed away at the age of 92 last year. He also served as Canada's Commissioner of Official Languages. Dr. Goldbloom was a champion throughout his life of building bridges between English- and French-speaking communities and between those of diverse faiths. All Secondary IV and V students who live or study within the borders of the D’Arcy-McGee riding (Côte Saint-Luc, Hampstead and parts of NDG and Snowdon) are eligible. They are invited to submit essays of no more than 700 words on the general theme of “Vivre ensemble”. They are entirely free to choose their specific subject to address that theme. Entries can be submitted in English or French, but they must include a single-paragraph summary in the second language. Entries must be received no later than Friday, May 26th, 2017 at 4:00 p.m. at fran.gutman@assnat.qc.ca. SHAKESPEARE SELFIE: CBC's annual writing challenge for students is fast approaching! Shakespeare Selfie is a national contest open to students in two age categories: Grades 7-9 and Grades 10-12 from April 10 to 28. What Shakespeare Selfie is: Shakespeare Selfie challenges students to reflect on what Shakespeare would say about the world day. Last year's winners wrote about the U.S. presidential primaries and Beyonce's Lemonade album The prizes: An iPad mini for each of the winners, and 50 YA books for each of their school libraries! Plus, the work of the 20 finalists are published on cbcbooks.ca. On another note, CBC would like to encourage people to sign up for CBC Books' student writing challenge newsletter. This newsletter will keep you up to date on youth writing challenges that we run. We will send reminders to you when a new challenge opens, as well as helpful tips from past winners and inform you when the winners are chosen. Sign up on the Shakespeare Selfie page. Scroll to the middle of the screen and enter your email address where it says "Subscribe to our student writing challenge newsletter." Info: jane.van-koeverden@cbc.ca or log on to http://www.cbc.ca/books/2017/01/shakespeare-selfie-2017.html. INTERFAITH CELEBRATION: Canadians for Coexistence will hold their annual Interfaith Celebration for World Peace uniting people of all faiths. It will take place on Sunday, May 21 (3 pm to 5 pm) at Shaare Zedek Congregation (305 Rosedale) in NDG. Students and staff are encouraged to attend. Here is the flyer. WRITERS CONTEST: The Ya Writers Contest has been getting great reviews and as a result, they have decided to extend the story submission deadline to Monday, May 1, 2017. This will allow for more students to enter the short story contest. They have since adjusted their grand prizes to have five winners in each category be co-authors in their Ya! Storybook available worldwide on amazon. Submit all collected stories to your school office on May 2, 2017. Your main office will then send them to Michael Cohen at the EMSB Central Head Office through internal mail. Please make sure all stories include a cover page, name of student, school, grade and email address for invitation to the Ya show. Info:gmirabella@lbpearson.ca (Giancarlo Mirabella). JFKA students hit the slopes. JFK SOUND AND BODY: John F. Kennedy Adult Education Centre in St. Michel made major headway into incorporating sound body sound mind this winter. In the endeavor to encourage active outdoor participation in the winter and to foster an appreciation of Quebec and Canadian experiences, the centre’s administration, Elizabeth Lagodich and Jimmy Giannacopoulos, organized a memorable ski trip to Mont Habitant. Students were taken by deluxe coach to and from the slopes. Fifty one students and 10 staff braved a typical cold day in the Lower Laurentians, most of them enjoying their first time either in skis or on snowboards. These first timers were given lessons by the competent instructors of the resort. Many students did so well as to advance from the bunny hill to one on the beginner trails on the main hill. Accommodations were also made by the school to help those participants who needed to have the proper attire for this activity. Feedback was overly positive, with many of the participants asking if a second trip was already in the making. Members of senior management visited JFKA. OPEN HOUSE FOR SPECIAL NEEDS: Ms. Lagodich and Vice Principal Giannacopoulos hosted an Open House of the new Special Needs Program at the JFK Adult Centre recently. More than 40 guests attended this event. 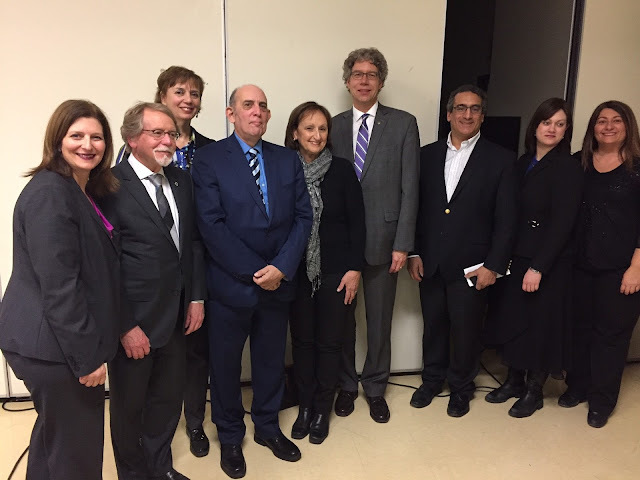 Present from the EMSB were: Cosmo Della Rocca, Ann Marie Matheson, Angela Spagnolo, Mario Argiropoulos and Pela Nickoletopoulos. This program is a result of a continuing partnership with the CRDITED de Montreal. Brigitte Boudreau, a director in this organization, spoke at length of the positive results she has witnessed since the initiation of this program in mid-September. Students from the program also gave their testimonials about their experiences . The students benefit not only from EMSB teacher Louise Panet-Raymond and facilitator Millena Tognarini, but also from CRDITED educator Diane Mayer. Together, the depth of their talents and experience allows for a program rich in diversity. academics, sports and leisure, outings and art are all components of this exciting program geared to promote autonomy and positive learning experiences. These activities are in addition to established work projects, such as recycling, selective classroom and cafeteria maintenance as well as assisting office and cafeteria staff. Each student has a supervised task which helps them integrate with staff and students within the school. A video montage was presented at the Open House to give the guests a chance to see the students in action. The SIS students and their teachers are once again breaking boundaries with their theater production “Wide Awake” which will be performed in May 2017(invitations to come). Our SIS teacher , Anna Persichilli , together with their SIS students are trying to get the band U2 to come and view their production at our Centre. We have created a video showcasing the production’s theme: overcoming grief through music. The main characters are the band members of U2 celebrating music legends that came before them and how songs have an immense impact on our lives. In the past few months, students have been learning to use musical instruments. Their confidence level soars when they play the drums and hold their guitars. They are so proud of themselves and cannot wait to share their achievements with their family and friends, and maybe even U2! To date we have received 7,000 hits on our Instagram concerning the U2 video and we have also been in contact with a spokesperson from the band U2!! Who knows, their dream of performing their production “Wide Awake” to Bono may come true!! THE BACHELOR CONTESTANT: Vanessa Grimaldi, a 29 year old special needs teacher at the Galileo Adult Education Centre, accepted a marriage proposal from Nick Viall before millions of TV viewers on the ABC reality show The Bachelor. See this report on CTV. 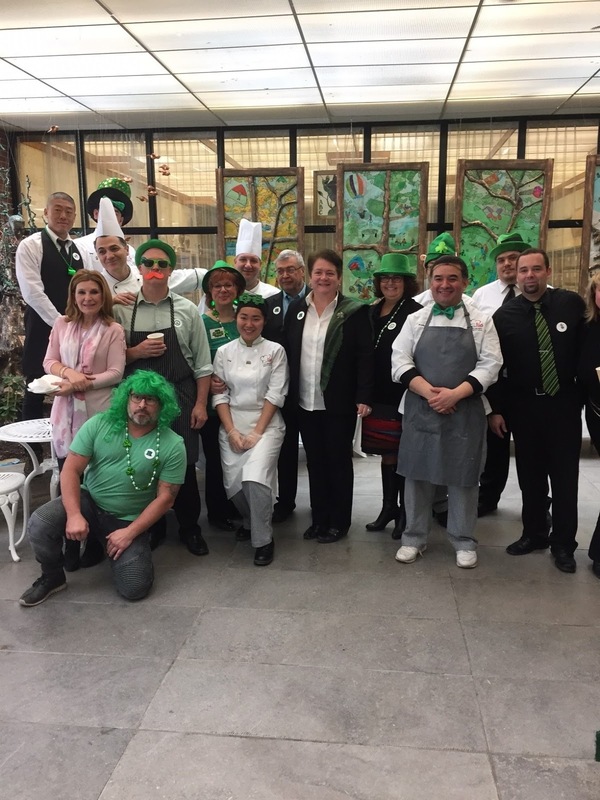 HAPPY ST. PATRICK’S DAY: Some of the staff members and students of St. Pius X Culinary Institute dropped in to the EMSB Central Head Office on St. Patrick’s Day to prepare Irish coffee and Zeppoles sprinkled with four leaf clovers! The treats were received with great appreciation, and the students enjoyed being festive on this very special day of green!! OPPOSITION À LA DÉCISION SUR LA REPRÉSENTATION ÉLECTORALE: La CSEM a donné son appui à une initiative qui s’oppose à une décision prise par la Commission de la représentation électorale du Québec. Cette dernière a publié une carte électorale qui restreint considérablement la représentation du district Ouest de Montréal à l’Assemblée nationale, passant de trois sièges à deux. En 2015, la Commission avait proposé de fusionner les circonscriptions Mont-Royal et Outremont et de modifier sensiblement D’Arcy-McGee. Au terme d’une vaste consultation publique, la Commission a annoncé le 7 février que le statu quo prévaudrait. Puis, le 2 mars, elle est revenue sur sa décision en publiant inexplicablement une nouvelle carte électorale. Angela Mancini, présidente de la CSEM, accompagnée de Sylvia Lo Bianco, vice-présidente; Julien Feldman, commissaire; et Joanne Charron, commissaire parent, ont assisté à une assemblée publique organisée par les arrondissements Côte-des-Neiges–NDG et Outremont, de même que les municipalités de Côte Saint-Luc, Hampstead et Ville Mont-Royal. Mme Mancini a qualifié la décision « d’anti-démocratique et problématique pour tous, y compris la CSEM, puisque nous perdons sur notre territoire un autre membre de l’Assemblée nationale avec qui collaborer ». LE FRANÇAIS POUR L’AVENIR : L’école FACE (3449, rue University) accueillera le forum local de Montréal 2017 du Français pour l’avenir le jeudi 6 avril, à 9 h. Sous le thème Respect, culture et intégration à la société québécoise, ce forum annuel vise à promouvoir le bilinguisme parmi les jeunes au Canada. Quelque 500 élèves provenant de dix écoles secondaires de la région de Montréal, de trois commissions scolaires et de trois écoles juives seront présents. À cette occasion, la fort sympathique comédienne montréalaise, Dorothy Rhau, agira à titre de maîtresse de cérémonie. FACE est la seule école à appartenir conjointement à la Commission scolaire English-Montréal et à la Commission scolaire de Montréal, ce qui en fait un endroit de prédilection pour la tenue d’un tel forum. Les participants assisteront à une prestation musicale du groupe NBGN, mettant en vedette RACCOON, et à une présentation spéciale de la part de Maude Morissette, comédienne et créatrice de la série Web primée qui s’intitule La Dump/The Dump. Le concept est en quelque sorte un amalgame de South Park et Sesame Street, animé par des marionnettes insolentes qui vivent dans les égouts. Elles sont malpropres, impolies et irrespectueuses. Les courts sketchs pertinents sont perçus comme « absurdes, rapides et drôles. » Cette série humoristique interactive s’articule autour du personnage Belle, ex-gagnante d’un concours de beauté issue d’une petite ville qui affiche une personnalité compulsive, naïve et dont la voix évoque celle d’un vieux fumeur. Elle dévore tout ce qui lui tombe sous la main : des Q-tips, des cailloux, des vis, du papier. Tout, sauf ce qui contient du gluten! Barbe, son amant et fils illégitime du Président Donald Trump, joue le rôle d’un mâle non alpha. Il semble issu d’un curieux croisement entre un Viking, un pirate, un cowboy, un Écossais et il porte toujours une arme. Il n’entend pas à rire. Ce couple dysfonctionnel mais fort attachant a été expulsé des États-Unis pour avoir troublé l’ordre public et il se retrouve maintenant à errer dans les souterrains au Canada avec leurs copains – la fée pas de face, la grand-mère morte, le fumeur muet, le lecteur de nouvelles et le dictateur sénile –, tous plus fous les uns que les autres. On y présentera également une version Le français pour l’avenir de l’émission La Voix diffusée sur les ondes de TVA (le pendant francophone de The Voice présenté à NBC). Trois participants de la communauté anglophone, Mike Valletta, David Marino et Hanorah, ainsi qu’Angelike Falbo, finaliste en 2015, partageront leur expérience puis tourneront leurs fauteuils de manière à faire dos à la scène pendant que des élèves interpréteront une chanson. À l’instar de l’émission télévisée, Mike, David et Hanorah entendront uniquement la voix des chanteurs et retourneront leur fauteuil seulement s’ils souhaitent qu’un d’entre eux se joigne à leur équipe. Parmi les autres activités, mentionnons un jeu-questionnaire interactif sur la culture canadienne et québécoise, une jeune troupe francophone de danse contemporaine et hip hop, OR PUR du studio de danse Urban Element Zone, et une grande finale interactive fort attendue mettant en vedette la Ligue d’improvisation montréalaise, qui ne manque jamais de divertir son auditoire. Le forum se terminera par la remise de superbes prix offerts par des commanditaires locaux (Bureau en gros, HMV, EMPIRE, Renaud Bray, etc.). Tout au long de la journée, les élèves seront immergés dans la langue française grâce à la panoplie d’activités prévues au programme. Ils en retireront sans contredit une grande fierté d’être bilingues et leur connexion à la culture québécoise dans laquelle ils évoluent au quotidien n’en sera que plus forte. Pour en savoir davantage, visitez le www.french-future.org. Voici les écoles participantes : école secondaire Westmount, Académie Royal West à Montréal-Ouest, Royal Vale à NDG, école secondaire John F. Kennedy à Saint-Michel, écoles secondaires Rosemont et FACE de la Commission scolaire English-Montréal (CSEM); Académie Lakeside à Lachine, école Lindsay Place à Pointe-Claire de la Commission scolaire Lester-B.-Pearson; école secondaire Howard S. Billings à Châteauguay de la Commission scolaire New Frontiers; et trois écoles secondaires juives – Bialik, Herzliah et Hebrew Academy. Pour en savoir davantage, visitez le www.french-future.org. CONFÉRENCE DE STEVEN ATME: Steven Atme, conférencier motivateur, est de nouveau accueilli à bras ouverts par les écoles de la CSEM où il véhicule le message que chaque individu devrait être reconnaissant pour la personne qu’il est, et ce, aussi bien à l’intérieur qu’à l’extérieur. S’adressant aux élèves des écoles East Hill à R.D.P., Gerald McShane à Montréal-Nord, Edward Murphy dans Hochelaga–Maisonneuve et à ceux du Collège Vincent Massey à Rosemont, Steven a répandu son message positif de bonté et a encouragé les élèves à aller au bout de leurs rêves. « Steven désire rejoindre les jeunes et écouter leurs histoires », a déclaré Rocco Speranza, animateur de vie spirituelle et d’engagement communautaire. « Il incite les jeunes à être bons envers les autres et envers eux-mêmes, et les amènent à changer leur perception à l’égard de ceux qui les entourent et qui sont différents, en plus de voir la bonté en chaque être humain. ROEN HIGGINS GRANDE GAGNANTE: Roen Higgins, éducatrice en service de garde et technicienne en comportement à l’école primaire Elizabeth Ballantyne de la CSEM, a remporté des honneurs dans le cadre de la Semaine de la persévérance scolaire (http://www.fonds1804.or). Cette grande optimiste débordante d’entrain qui est née et a grandi à Montréal a toujours su canaliser son énergie de façon créative. Tout le monde la reconnaissait à sa grande facilité d’élocution et sa maîtrise irréprochable de la langue. Malgré les recommandations de plusieurs de s’orienter vers l’écriture, la profession d’acteur, la peinture ou encore la comédie, elle a plutôt choisi de devenir intervenante auprès des jeunes. Elle est connue au sein de la communauté montréalaise en tant qu’intervenante, planificatrice d’événements et militante communautaire. D’autres la connaissent mieux sous le nom de Blu R’va, maintes fois lauréate sur la scène de l’improvisation et de la poésie slam. La passion de Roen c’est d’offrir une plateforme créative aux jeunes ainsi qu’aux jeunes adultes afin qu’ils puissent exploiter ce don dont Dieu leur a fait cadeau, ce qui, selon elle, s’avère une forme de thérapie exceptionnelle. Récipiendaire en 2012 du prix Gloria Mitchell-Aleong, ses réalisations sur le plan communautaire ont été soulignées lors du gala Black Theatre Workshop Vision. Elle est une architecte sociale et culturelle dont l’objectif est de pousser les autres à vivre pleinement leur vie en apprenant à se connaître, en réalisant leur plein potentiel et en bâtissant leur héritage, ce qui lui a d’ailleurs valu récemment en 2016 le prix Montreal Community Care pour son leadership communautaire. Au nombre des projets à surveiller mentionnons Black Gold Voices (un balado pour inspirer les créateurs de changement en les unissant à d’autres gens influents et prospères), Good Folkes (mise en relation d’ambassadeurs du changement en vue de faire une différence au sein de la communauté) et la ligne de vêtements Trooth Empire qui désigne un mouvement destiné à habiliter les jeunes à connaître leurs racines et à acquérir des compétences en littératie et en entrepreneuriat. UNE ENSEIGNANTE DE LA CSEM GAGNE LA COURSE À L’INVESTITURE: Dans ce que les experts politiques décrivent comme une étonnante victoire, Emmanuella Lambropoulos, enseignante à l’école secondaire Rosemont, a remporté l’investiture du Parti libéral dans la circonscription fédérale de Saint-Laurent–Cartierville, défaisant ainsi Yolande James, ex-membre de l’Assemblée nationale et ministre du cabinet québécois, ainsi que Mawhra Rizqy. Mme Lambropoulos, qui a vécu à Saint-Laurent toute sa vie, a fréquenté l’école primaire Gardenview et l’Académie LaurenHill pour ensuite entreprendre une carrière en enseignement. EN AVANT TOUTE: L’école primaire Elizabeth Ballantyne à Montréal-Ouest poursuit ses efforts dans le but d’adopter le programme STIAM (Sciences, Technologies, Ingénierie, Arts et Mathématiques). Les élèves de deux classes ont récemment travaillé sur un projet STIAM où ils ont dû construire une catapulte capable de faire tomber une tour en carton. Ils ont été divisés en groupes et ont reçu des consignes précises. Ils ont adoré ce projet qui leur a permis de travailler en collaboration avec leurs pairs et d’établir des liens avec les thèmes enseignés en classe. MARS MARQUE LE MOIS DE LA NUTRITION: Mars est le mois de la nutrition partout au Canada. Pour l’occasion, le Service des cafétérias et de l’éducation en nutrition a concocté une brochette d’activités sous le thème de la nutrition. Cette campagne a pour but de promouvoir de saines habitudes alimentaires au quotidien en sensibilisant les jeunes au rôle de la nutrition et en améliorant leurs connaissances relatives à la nutrition. Nous invitons les écoles primaires à célébrer le Mois de la nutrition 2017 en relevant le défi Cap sur la santé - Êtes-vous prêts à adopter de saines habitudes? et d’autres défis éducatifs et amusants qui portent sur divers thèmes en lien avec la nutrition. Si vous participez, votre classe accumulera des points pour chaque activité complétée et pourrait gagner un atelier culinaire! De plus, des activités en classe, qui visent à fournir aux élèves les outils essentiels pour leur permettre de lire et de mieux comprendre l’étiquetage nutritionnel, sont disponibles tout au long de l’année dans les écoles primaires, dans le cadre de « Je lis ce que je mange ». Animées par une diététiste de la CSEM, ces activités constituent la base pour permettre aux élèves de la maternelle jusqu’à la 6e année d’accroître leurs connaissances en matière de nutrition et les aider à choisir des aliments sains. Pour en savoir davantage sur les activités « Je lis ce que je mange » et sur le Mois de la nutrition 2017, veuillez communiquer avec Emily Rose Hamilton-Leavitt au 514 483-7200, poste 7368 ou à ehamilton-leavitt@emsb.qc.ca. ACTIVITÉ POUR LES ÉCOLES SECONDAIRES: Dans les écoles secondaires, le programme sur la nutrition intitulé « Nourrir les cerveaux et les esprits de nos élèves » sera présenté sous forme de séances en classe destinées aux élèves de 1re et 2e secondaires durant les cours d’éducation physique. L’objectif vise à encourager les élèves à adopter de saines habitudes de vie grâce à une bonne alimentation et à l’activité physique, ainsi qu’à les sensibiliser aux influences sociales à l’égard de leur perception de la santé et du bien-être. Dans les écoles secondaires, la campagne de la CSEM dans le cadre du Mois de la nutrition 2017 s’intitule Cap sur la santé - Êtes-vous prêts à adopter de saines habitudes? À cette occasion, les enseignants et les élèves des écoles secondaires sont invités à participer à des activités et défis éducatifs afin de fournir aux élèves les connaissances et les outils essentiels pour faire des choix plus éclairés en matière d’aliments et de boissons. Pour de plus amples renseignements sur les activités « Nourrir les cerveaux et les esprits de nos élèves » et sur le Mois de la nutrition 2017 dans les écoles secondaires, veuillez communiquer avec Giuliana Di Quinzio au 514 483-7200, poste 7287 ou à gdiquinzio@emsb.qc.ca. VISITES DE MARC GARNEAU: Le 27 février dernier, l’école Marymount a tenu sa 15e Expo-sciences annuelle. L’activité s’est déroulée dans le gymnase de l’école. Au total, trente-trois projets ont été exposés par des élèves de la 1re à la 3e secondaires, et toutes les classes de l’école ont pu visiter l’exposition. Marc Garneau, ministre fédéral des Transports et député libéral de la circonscription NDG-Westmount, a également pris part à cet événement. Il a observé les projets exposés et s’est adressé aux élèves. Il a aussi répondu aux questions en lien avec son expérience en tant qu’astronaute. Le Département des sciences de Marymount porte le nom de M. Garneau en l’honneur de sa passion pour les sciences et de ses nombreuses contributions pour le Canada et en son nom. Élèves et membres du personnel ont grandement apprécié cet événement. LLOYD BARKER, CONFÉRENCIER MOTIVATEUR: Ex-capitaine adjoint de l’Impact de Montréal, joueur le plus utile de son équipe, joueur étoile de la ligue et ancien entraîneur-adjoint, Lloyd Barker visite des écoles à titre de conférencier motivateur. Ses exposés s’adressent aux élèves âgés de huit ans et plus. Il offre ses services à titre gratuit. En retour, il demande simplement que l’école distribue aux élèves présents des dépliants de sa nouvelle académie de soccer. Ses présentations portent à la fois sur des thèmes de motivation (persévérance, appréciation, etc. ), sur l’importance de ne pas abandonner l’école, de même que sur l’entraînement et le bien-être. La durée de la présentation est de 60 à 75 minutes. Il suggère aux écoles de regrouper les groupes dans le gymnase pour la présentation. Il anime les présentations en matinée, de préférence. L’académie de soccer Barker Elite Soccer Training enseigne habilement aux joueurs chacune des techniques de base essentielles au soccer pour leur permettre de s’améliorer sur le plan technique et d’exécuter parfaitement les diverses habilités, et ce, de façon constante. Lors de l’enseignement des diverses techniques, on explique aux joueurs exactement le rôle de chacune d’entre elles sur le plan tactique durant les matchs. Les programmes d’entraînement sont conçus de manière à s’adapter individuellement à chaque joueur et s’inspirent du modèle Développement à long terme du joueur et phases de développement de l’Association canadienne de soccer. En limitant à quatre le nombre de joueurs de chaque groupe assignés à nos entraîneurs expérimentés, les joueurs profitent d’une attention individuelle à chaque séance d’entraînement. Pour en savoir davantage sur son académie, visitez le www.best11academy.com. Vous pouvez communiquer avec Lloyd par courrier électronique à lloydbarker11@yahoo.com. QUÊTE SPIRITUELLE: Le jeudi 20 avril, les animateurs de vie spirituelle et d’engagement communautaire (AVSEC) et les élèves de la CSEM prendront part à une activité qui les amènera à visiter des sites spirituels sacrés et à faire preuve de compassion afin de développer une plus grande conscience spirituelle. Selon les traditions des Premières Nations, la quête spirituelle peut mener à un changement intérieur, une guérison, une ouverture vers les autres et vers le divin. Lors du lancement de l’activité Quête spirituelle, plusieurs liens seront créés avec le Jour de la Terre, notamment la célébration des traditions des Premières Nations pour protéger la planète et veiller au bien-être de chacun. Cette troisième Quête spirituelle organisée par les AVSEC de la CSEM visera 12 établissements : l’école secondaire John F. Kennedy à Saint-Michel, l’école secondaire John Paul I à Saint-Léonard, l’école secondaire Laurier Macdonald à Saint-Léonard, l’école secondaire Lester B. Pearson à Montréal-Nord, l’Académie LaurenHill (junior et senior) à Ville Saint-Laurent, l’Académie internationale Marymount à Montréal, l’école secondaire Rosemont à Rosemont, l’école secondaire Royal Vale à NDG, l’Académie Royal West à Montréal-Ouest, le Collège Vincent Massey à Rosemont et l’école secondaire Westmount à Westmount. Les équipes qui participeront à la Quête spirituelle débuteront leur périple d’un jour au centre administratif de la CSEM situé au 6000, avenue Fielding à NDG, dès 8 h 30 et cette activité se terminera vers 15 h au lac aux Castors sur le Mont-Royal. Les élèves devront prendre des photos, réunir de l’information et se sentir inspirés à redonner à leur communauté. Au nombre des activités prévues, mentionnons : visiter et honorer des sites sacrés et se renseigner sur l’histoire des différentes communautés culturelles et confessions religieuses à Montréal, visiter le Mont-Royal pour un moment de réflexion, partager nos espaces verts et en prendre soin. L’un des objectifs des AVSEC vise à aider et à encourager les élèves à se montrer au meilleur d’eux-mêmes et à exprimer leurs propres vertus positives et traits de caractère. Il s’agit du « Programme des vertus ». Ce programme est dispensé par les AVSEC et constitue le fondement de la Quête spirituelle qui se veut une journée vers une meilleure compréhension de soi. Chaque équipe devra être composée de tout au plus 6 élèves âgés de 12 à 16 ans et d’un AVSEC. À l’aide d’indices, ils devront se déplacer d’un endroit à l’autre, à pied ou en empruntant le transport en commun écoresponsable, et devront relever en route des défis de nature spirituelle. Cette activité permet aux élèves de visiter des sites civiques, historiques, spirituels et d’organismes communautaires tout en tirant une expérience personnelle leur permettant de développer des vertus positives et des traits de caractère, de resserrer les liens entre les écoles et la communauté, ainsi que leur relation étroite avec la Terre et leur propre spiritualité. ANNULATION D’UN VOYAGE AUX ÉTATS-UNIS (ARTICLE TIRÉ DU QUOTIDIEN MONTREAL GAZETTE) : Sabrina Jafralie enseigne le cours d’éthique au secondaire et ses élèves ont récemment été confrontés à une situation réelle qui a mis leur caractère à rude épreuve. Les élèves de l’école secondaire Westmount avaient planifié un voyage à Washington, D.C. au printemps. Or, en raison des restrictions de voyage récemment décrétées par le gouvernement américain, certains élèves auraient pu être renvoyés à la frontière. En effet, le président Donald Trump a signé un décret présidentiel qui interdit temporairement l’accès aux États-Unis aux ressortissants de six pays à majorité musulmane. Puisque trois élèves de Mme Jafralie viennent de l’Iran — l’un des pays visés par cette interdiction de voyager — elle a rencontré l’ensemble de la classe avant la semaine de relâche et leur a présenté le dilemme suivant : Est-ce que tout le groupe devrait se sacrifier pour protéger les droits de quelques-uns de leurs pairs? «Si c’eut été un test, ils auraient réussi haut la main », a indiqué Mme Jafralie. « L’idée de laisser l’un des leurs derrière eux n’était pas envisageable pour les élèves. Ils ont donc décidé d’opter pour une autre destination. La majorité s’est élevée pour protéger les droits de la minorité. Ils ont adopté une attitude « tous pour un et un pour tous. Ils se sont levés et ont déclaré que si l’un d’entre eux ne pouvait être du voyage, alors aucun n’irait. Je suis tellement fière d’eux ». Bien que Mme Jafralie reconnaisse que la nouvelle destination — Toronto et Niagara — ne revêt pas la même allure que la capitale américaine, elle dit qu’un plus grand nombre d’élèves se sont inscrits au voyage depuis le changement de cap. Quelque 100 élèves et enseignants feront donc le voyage. Mme Jafralie a voyagé aux États-Unis durant la semaine de relâche et avoue qu’elle était nerveuse à l’idée de franchir la frontière. Son père étant de nationalité indo-musulmane, elle craignait que cela lui cause des ennuis à la frontière. EXPLORATION DE CARRIÈRES AU CUSM: À quoi ressembleraient des études en médecine et une carrière dans le domaine des soins de santé? C’est la question à laquelle 57 élèves du secondaire ont obtenu réponse lorsqu’ils se sont rendus au site Glen le 27 février dernier dans le cadre des activités de la Journée d’exploration de carrières. À la demande de la Commission scolaire English-Montréal (CSEM), l’équipe des communications du Centre universitaire de santé McGill (CUSM) et l’Hôpital de Montréal pour enfants ont organisé une visite au site Glen. L’activité a débuté par une tournée animée par les bénévoles Les amis du CUSM. Cette visite guidée a permis aux élèves de 4e et 5e secondaires de se familiariser avec nos installations en soins de santé et en recherche. Par la suite, Dr Marie-Pier Dumas, résidente en chef à l’Hôpital de Montréal pour enfants, a rencontré les élèves et leur a parlé de son parcours pour devenir médecin. Elle a décrit en détail son expérience en tant qu’étudiante en médecine et résidente, soulignant les exigences et attentes sur le plan académique et les activités sociales et communautaires auxquelles elle a pris part. Les élèves ont ensuite rencontré Dr Jae-Marie Ferdinand, pédiatre à l’Hôpital de Montréal pour enfants et directrice du programme de formation en pédiatrie sociale à l’Université McGill. Forte de sa vaste expérience dans ce domaine, Dr Ferdinand a expliqué aux élèves la multitude de rôles et fonctions qu’elle accomplit, qu’il s’agisse de son travail quotidien à l’hôpital médical de jour du CUSM, de son engagement à titre de consultante en pédiatrie dans les Centres de la jeunesse et de la famille Batshaw ou du programme Portage mère-enfant. Elle a souligné que la passion qu’elle éprouve à travailler avec les enfants et son désir de poursuivre son apprentissage l’ont guidée tout au long de sa carrière. Elle a aussi insisté sur l’importance de posséder de bonnes compétences en gestion du temps. Lorsque les élèves lui ont demandé ce qu’elle changerait si c’était à refaire, Dr Ferdinand a répondu : « J’aurais passé plus de temps à jouer. » Comme elle l’a expliqué, lorsqu’elle était étudiante, les universités accordaient une grande importance à l’excellence des résultats scolaires pour l’admission en médecine. Or, aujourd’hui, ils recherchent des candidats bien équilibrés et accomplis. Elle encourage les élèves à travailler fort, mais aussi à prendre le temps de pratiquer des sports ou de s’adonner à des activités artistiques qui leur procurent du plaisir. UN ESPRIT SAIN DANS UN CORPS SAIN À JFK: Le Centre d’éducation des adultes John F. Kennedy situé à Saint-Michel a réalisé d’importants progrès cet hiver en incorporant le principe d’un esprit sain dans un corps sain. Soucieux d’encourager la pratique d’activités extérieures durant l’hiver et d’aider les élèves à apprécier des expériences québécoises et canadiennes, les administrateurs du Centre, Elizabeth Lagodich et Jimmy Giannacopoulos, ont organisé un voyage de ski mémorable au Mont Habitant. Les élèves ont pris place à bord d’un autocar de luxe pour l’aller-retour. Cinquante et un élèves et dix membres du personnel ont bravé une journée typiquement froide dans les Basses-Laurentides. C’était pour la plupart d’entre eux une première expérience en ski ou planche à neige. Les débutants ont eu droit à un cours d’initiation donné par des instructeurs expérimentés de la station de ski. Certains élèves ont appris si rapidement qu’ils sont passés de la pente-école à l’une des pistes pour débutants sur la montagne principale. Des arrangements avaient également été pris par le Centre afin de fournir aux participants la tenue vestimentaire adéquate pour cette activité. Les commentaires ont été des plus positifs. De fait, bon nombre de participants se sont empressés de demander si un deuxième voyage est à prévoir. JOURNÉE PORTES OUVERTES POUR LES ÉLÈVES AYANT DES BESOINS PARTICULIERS: Mme Lagodich et M. Giannacopoulos, directeur adjoint, ont organisé récemment une journée portes ouvertes au Centre d’éducation des adultes JFK afin de présenter le nouveau programme destiné aux élèves ayant des besoins particuliers. Plus de 40 personnes étaient au rendez-vous. La CSEM était représentée par Cosmo Della Rocca, Ann Marie Matheson, Angela Spagnolo, Mario Argiropoulos et Pela Nickoletopoulos. Ce programme est le fruit d’un partenariat continu avec le CRDITED de Montréal. Brigitte Boudreau, l’une des directrices de cet organisme, a parlé longuement des résultats positifs dont elle a été témoin depuis la mise sur pied du programme à la mi-septembre. Les élèves du programme ont également exprimé leurs commentaires à la lumière de leur expérience. Ils peuvent compter non seulement sur l’enseignante Louise Panet-Raymond de la CSEM et l’animatrice Millena Tognarini, mais aussi sur Diane Mayer, éducatrice du CRDITED. L’étendue de leur talent et de leurs expériences contribue à la diversité du programme. Ce dernier, qui vise à promouvoir l’autonomie et des expériences d’apprentissage positives, comporte des volets axés sur la pédagogie, les sports et loisirs, les sorties ainsi que les arts. Ces activités s’ajoutent à des projets établis tels le recyclage, l’entretien sélectif des classes et de la cafétéria ainsi que le soutien au personnel de bureau et de cafétéria. Chaque élève se voit confier une tâche supervisée qui facilite son intégration parmi le personnel et les élèves du Centre. Un montage vidéo a été présenté lors de la journée portes ouvertes pour permettre aux visiteurs de voir les élèves dans le feu de l’action. Une information très utile! Merci! Mon collègue a conseillé Nexter pour le même type de contenu.